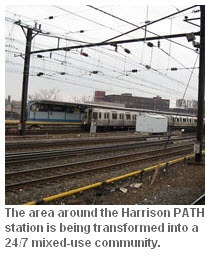 HARRISON, NJ-When the Port Authority of New York and New Jersey announced this week it would move ahead with replacing the antiquated platform at the Harrison train station, six major developers at work in the surrounding community cheered with coordinated gusto. Very coordinated. Possessing all the polished synchronicity of a champion cheerleading squad, in fact –a rare mode for competitive developers at any time, but perhaps most unusual in the midst of economic crunch times. “It is highly unique, I think,” Peter J. Cocoziello, president and CEO of Advanced Realty, tells GlobeSt.com. “We have formed our own association to collectively cheer everyone on in getting the master plan underway for Harrison to become a true 24-hour, live-work-play community.” Advance is the so-called master developer for the 245-acre project begun 10 years ago. The massive retooling of a deteriorated site dating to the Industrial Revolution took longer than originally expected. The Red Bulls soccer arena and several condominiums besides the Passaic River were completed in the past few years. Then, last summer, the 275-unit Harrison Station rental apartments opened and leased up with surprising speed. This spring and summer construction is about to “go vertical” on a second rental building and a hotel; meanwhile, demolition work is underway so work can begin early next year on a retail center with housing above it. Recently, says Goldberg, Harrison’s longtime mayor Raymond McDonough appealed to the developers, asking them to help jumpstart the overall development again. All responded enthusiastically, and said they have found it surprisingly exhilarating to work in concert. “The new train station is going to be a game-changer,” says Cocoziello after the Port Authority formally voted Monday to authorize the $250 million replacement of the 76-year-old existing station, starting work next year. “It will create Harrison as a true destination, with a gorgeous new glass-and–steel station facility providing an incredibly quick commute to New York via the PATH. Harrison is actually closer to New York than Midtown is to downtown.” “We are all thrilled, as a group and as individual companies,” adds Goldberg, who said the developers’ group met with New Jersey officials several months ago to advocate for expediting the Port Authority funding. • Russo will begin vertical construction of a 300-unit rental apartment building in May or June. • Ironstate, which opened the first apartments adjacent to the train station last July, will start work this summer on a 138-unit Element by Starwood hotel. • Roseland plans a late-summer start on a 141-unit rental building beside its condominium development. Heller expects to begin work on a building with ground-floor retail and 65 rental units above, as soon as demolition of a building across Frank E. Rogers Boulevard from the Harrison Station apartments is complete.